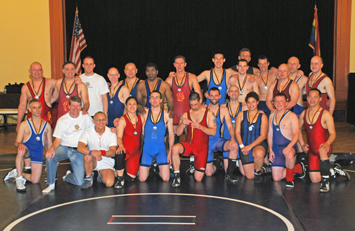 JOIN DENVER WRESTLING CLUB TODAY! Print out and complete the DWC Wrestler Info Sheet and DWC Liability and Release Waiver and bring them to your first practice along with a current and valid government issued ID. Purchase your USA Wrestling Card Online! NOTE: If you already own a current 2019 USAW Card, it is valid to wrestle at DWC and you do not need to purchase another card. Click "Join or Renew Online." If you are a new USAW member, you will create a new account. Returning members will use their current USAW card number and password to login. From the membership type dropdown box, select "Denver Athlete Membership. For club, type ''DENVER WRESTLING CLUB"
Acknowledge the RELEASE AND WAIVER OF LIABILITY, ASSUMPTION OF RISK, AND INDEMNITY AGREEMENT WITH PARENTAL CONSENT ("AGREEMENT") and click continue. You will then complete your payment information using your credit or debit card. You can then print a copy of your USAW card or save a copy to your smartphone. You are now in USA Wrestling's system! Future renewals each season will take less steps by just logging into your account. If you lose your USAW card, just log back in to print a new one! Store your username/password in a safe place! Keep a copy of your USAW card in your wrestling bag. ...Show a copy of your new USAW membership card to Coach Greg on or before your first practice. Our staff will be verifying that you are insured. If you have any questions please contact Coach Greg.